After being tossed into chaos on 29 August as heavy rains lashed the city, Mumbai is limping back to normalcy. But as the India Meteorological Department (IMD) forecast more torrential rains over the next few days, Mumbai may still have an ordeal left to face. As of early afternoon on 30 August, water started receding from most parts of the city, but low lying areas continue to be flooded, leaving road and train traffic remains affected. Millions of people were left stranded in suburban trains, offices and railway stations. Thane and Navi Mumbai too experienced extreme flooding. The heavy rains on 29 August refreshed the memories of 26 July 2005 that had brought India's financial capital to a grinding halt. The heavy rains have claimed seven lives so far and nine people have been injured. More so, a doctor from Bombay Hospital, Dr Deepak Amrapurkar, left for home from Bombay Hospital in the evening on Tuesday and has gone missing. Rescue teams recovered his umbrella from a manhole in Lower Parel. 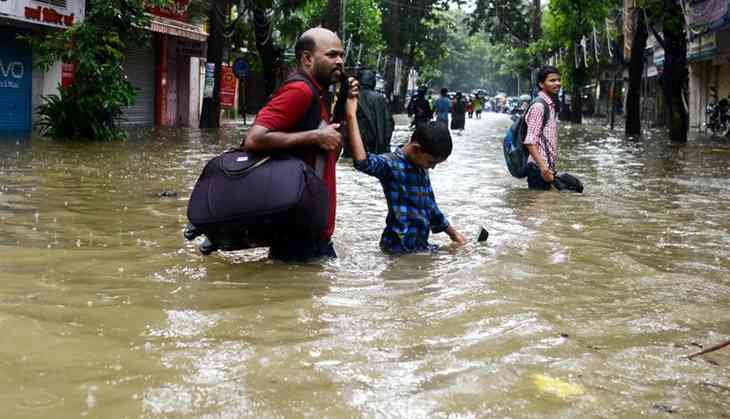 Though the intensity of the rain reduced on Wednesday, many low lying areas such as Hind Mata, Dadar, Lower Parel remained flooded as the water could not recede due to choked storm water drains. Mumbai has reportedly received the highest rainfall in 12 years. The total rainfall within 12 hours – 8 am to 8 pm – on 29 August was recorded to be 328 mm at Santa Cruz and 110 mm at Colaba. MeT Department officials have appealed to people to remain indoors on Wednesday as well. "The city faced an extraordinary weather condition due to low pressure area over Arabian sea. In all, 23 areas of Mumbai received more than 200 mm rainfall during the 12 hours on 29 August. The civic body had made all the necessary arrangements to tackle the situation. Extra buses were run to ferry stranded commuters to nearest railway stations. More than 1000 buses are plying on Chhatrapati Shivaji Maharaj Terminus (CSMT) to Thane route,” Ajoy Mehta, Municipal Commissioner, Mumbai. He said that the civic body has removed 5000 metric tonnes of garbage from coastal areas, which was flown in during the rainfall and high tide. The critical situation arrived due to very heavy rainfall in such a short span of time. Considering the gravity of the situation, National Disaster Response Force (NDRF) was put on high alert. “We have deployed 10 teams of NDRF in Mumbai and three others are kept on red alert. We are prepared to handle any situation,” said Sanjay Kumar, DG, NDRF. Apart from the NDRF, Municipal Corporation of Greater Mumbai (MCGM) and various social organisations - the Indian Navy as well - came out to help those who were stranded. The Navy made special arrangements to distribute food in CSMT, Churchgate, Byculla, Parel, Worli,Tardeo, Mumbai Cnetral, Mankhurd, Chembur, Malad, Ghatkopar and Hind Mata areas. According to the disaster management room of MCGM, the water had receded from the KEM Hospital which was flooded yesterday. The total rainfall during the intervening night on 29 and 30 August was recorded to be 111 mm at Colaba and 331.4 mm at Santa Cruz. Though water receded on Wednesday morning, traffic on many roads could not come back to normal due to the obstacle posed by abandoned vehicles. Know more about Jordan and its culture!